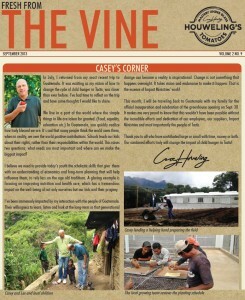 Also, take a look at “The Vine” to learn how we are improving the trace-ability of our produce, hear about the reputation of our propagation program and join us in honoring our long-term employees that have helped make Houweling’s the company it is today. 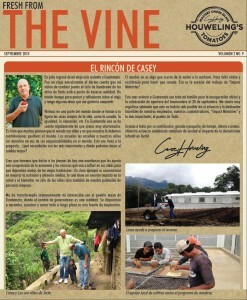 Click the image below to read the September 2013 Vine en Espanol. 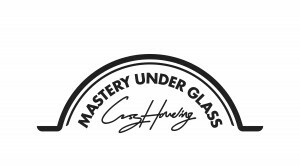 This entry was posted in charity, Culture, Greenhouse Grown, Health, Life, Newsletter, Sustainability, Tomatoes and tagged Greenhouses, Houweling's Tomatoes, Kubo Greenhouse Projects, Newsletter, Seeds of Tomorrow, The Vine. Bookmark the permalink. Comments are closed, but you can leave a trackback: Trackback URL.